Regarde le link thingverse du premier post. Le BOM est dans la description. I'll be moving to the E3D v6. Could you send me the effector Sketchup so I can modify it to fit the E3D (or, if you already have it, it's even better!). (yeah, I dont even have it yet that I do upgrade... lol... I got all the parts now and should receive the printer parts the week.. I'm looking at a Heatbed solution). Edited 1 time(s). Last edit at 07/01/2014 09:21PM by nka. I'm away from home until next week with no access to my files. I can send it when I'm back. Which effector file do you need? The e3D mk6 is superb. I have one in a core xy machine I built. It's a direct replacement for a j head.. If you fit the cooling fan as per your previous posts you shouldn't need to change anything. 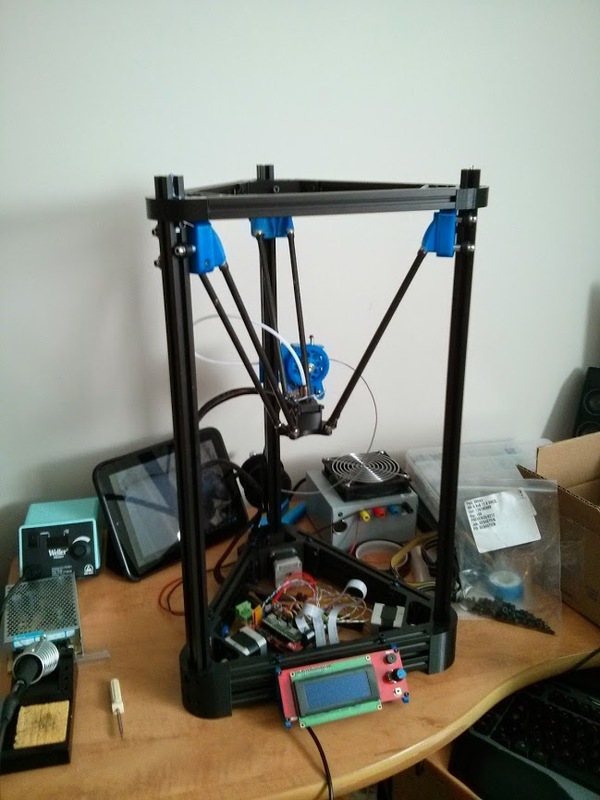 @nka, I picked up an E3D v6 hotend as well, and am looking at how I plan to fit the fan. It does look like it could fit where you suggested, but that would cover one of the screw holes for a spring on that side. It would be necessary to find a new anchor for the spring. Have you given any more thought to how you're going to make it fit? I'd be interested in your solution if you have one. I have that exact setup with a JHead. It works fine. You will find one decent spring on the other side is sufficient, or, alternatively, a rubber 'O' ring works great too! To save wires you can run the hotend cooler fan from the +VE side of the part cooling fan and the -VE side of the thermistor. That gives a permanent 12V whilst the RAMPS board is powered. Thanks for your quick responses Andy. I was very reassured to hear that you made it work with the fan like that, and that may be what I end up doing. It's got the ridiculous Nema23 motor mounts on it. Unfortunately, the very next thing I did was over-tighten a screw and snap a piece off that big central nozzle holder. So I'll be re-printing that, and may notch out a special square for the fan, like nka outlined originally, before printing. We'll see. Any ideas for a graceful way to unstick magnets that have been glued by CA? Update: Google says acetone will work. I'll try that when I can. Edited 1 time(s). Last edit at 07/10/2014 11:52AM by maso. Look great, I begun to build mine, but I have 1-3 20-30 minutes per day (got a new born) so it's not going fast. For the magnet, you can try to heat them with a soldering iron, glue should melt so you'll have time to remove it. That looks great. Love the blue and white. Shame about the breakage. Acetone should get you your magnets back but you may have to soak them overnight.. Can't wait to see the 'first print' video! Edited 2 time(s). Last edit at 07/10/2014 09:17PM by KtB. weird, I connected a 4mm ID / M5 thread PTC into the hole of the extruder, and my filament is blocking (into the PTC thread... if I'm lucky it goes trough and its working)... I was looking, maybe I could use 4mm ID / M10 (I dont have those) or make an adapter? EDIT: Yeah... seems this is what I need to do. People on RichRap are using 1/8 OD, 4mm ID... but I'm a little confused, since the hole is about 9.5mm and 1/8" is ~3.17mm. Plus, the most I've seen dont have any bevel inside... so it can still kick the wall? I need a printer to make an adapteur for my printer! EDIT 2: Or maybe I could try to bevel my M5 entry... but I doubt it. Edited 5 time(s). Last edit at 07/11/2014 11:03PM by nka. Oh, nice to know, thanks! I managed to make my M5 PTC work very fine by make a bevel to the entry point (using a drill bit). Almost all finish... I only have the endstop with some wiring and the carriage wheels to install. I got a one week child, so I dont have a lot of time ! G30 work, but it "slam" into the bed... so much that a motor may skip steps, so when it begin calibration, he's not in the middle. Speaking of calibration... I need to lower the "BED_DIAMETER" to 40, else my arms are disconnecting. What wrong I did ? The magnet hold pretty strong, they seems to disconnect at angle (when one axis is moving to far). Edited 6 time(s). Last edit at 07/18/2014 10:57PM by nka. Looks great. If you are having arms disconnecting it may be that the delta rods are not exactly the same length. Check them. Another reason could be the bowden/cable loom is too tight and causing a twisting moment. Remove the hot end from the effector and check the motion again to test for this. Also check that the effector is flat. If it warped slightly during printing it has the same effect as the rods not being of equal length. yes its a webOS TouchPad, but its running Android, I got it on sales for 99$ when HP discontinued them. It's used as a baby monitor now. I've checked the arms, they are all the same, but I think the some magnet might not be fully push. I'll try to re-glue them. Got an idea for the slamming into the bed before the calibration? It's like he's trying to go "too low" after hitting the endstop. btw, I found one of the magnet was very weak... I tried to remove it to replace it, but was I was expecting happened.... the part snapped. Did I tell you it's my first (non-fonctionnal) printer ? Hope CA glue will hold the part! Edited 1 time(s). Last edit at 07/19/2014 11:35AM by nka. I dont know where to look... All my tower are at the exact same height, if I push all the Carriage to the top, the effector is not even. All my rods are the exact same size (if I move them to another place, it still uneven in the same way). It certainly looks like the arms are unequal, this would include the magnets and the possible warping of the effector. It may also be a carriage that isn't square to the tower. Check the top of each carriage is at 90 degrees to the tower side. I've just finished my 10th Cherry Pi build and not had this issue so far. I'll look at the carriage, seems straight but maybe it's not. Since I've swapped the arms from one side to the others and its stay the same way, the carriage is the only thing left to look. 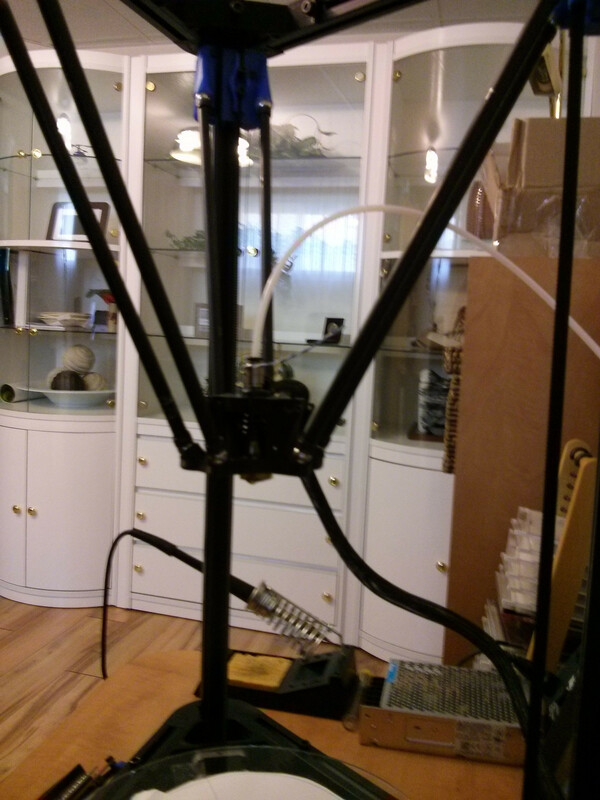 I also tried to rotate the effector, still down on the X axis (Or "up" in other one?). Your in the UK Andy? If I do not figure it out, how much (if you agree) for the carriage (without wheels), effector and arm assembled/tested with milled bolt and magnet? I'm in Canada. The problems is that I have little time to trouble shooting with kids (even more with the newborn) and jobs, so eliminating those would help. Do not feel like you have failed, nka. There are plenty of people here every day who never made it as far as you did! Edited 1 time(s). Last edit at 07/19/2014 08:37PM by nka. Necessity is a mother, as they say. I imagine that you know all about that for the past week of parenting duties. haha thanks for sharing the fact that it's not always working as it should. 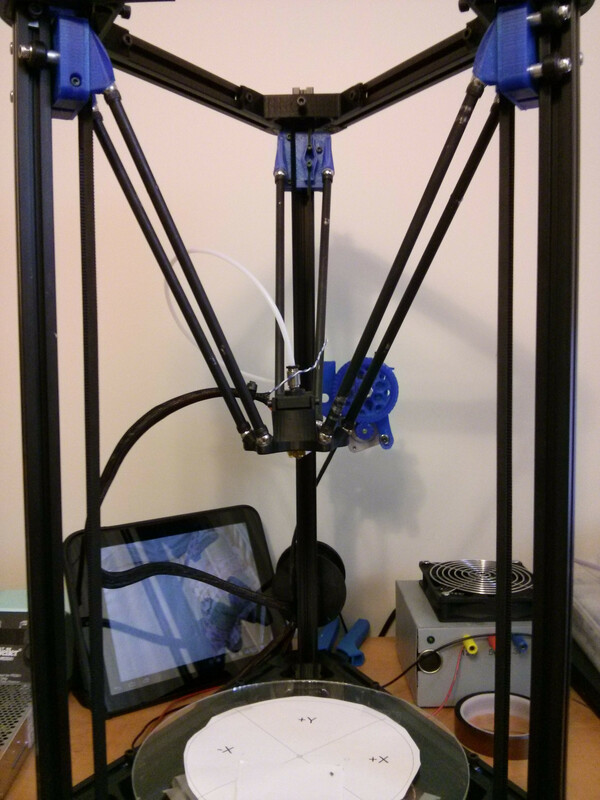 Got the printer to work (It's working if I stay into the little 50mm radius). The shape is right (true circle) but the size is not (36mm instant of 32mm), plus I had problems with the jhead gloged (guess the E3D v6 with fan will be better). Still need to calibrate, I'm not sure how to calibrate the size... I guess it's the mm per step (I'm at 80)? At least, this small print make me smile. Hope I'll fix it to get full size! Edited 1 time(s). Last edit at 07/20/2014 11:08PM by nka. Home your carriages. Mark the bottom of one on the extrusion. In Pronterface or another host program, tell the printer to go down (Z) 100mm. Measure the distance that the carriage actually traveled. Adjust your steps/mm until you get 100mm.